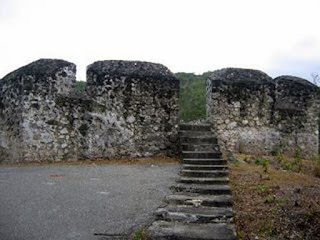 Otanaha Fortress is one of the tourism sites in Gorontalo province, Indonesia. It was built in 1522 by King Ilato from Gorontalo Kingdom and Portuguese sailors to strengthen the area security and defense. This fort is located in Dembe Hill and was made from mixture of sand, calcium, and eggs of Maleo birds. To reach the top of this fort, there are 348 steps, which separated into four stopovers: 52 steps from base to the first stopover, 83 steps from first to second stopover, 53 second to third stopover, and 89 steps from third to fourth stopover. From the last stopover, there are another 71 steps to reach the fort. From the top of this fortress, there are panoramic view of Limboto Lake and some part of Gorontalo region. According to history, in 15th century, the Portuguese sailor stopped in Kota Barat, Gorontalo because of the bad weather, pirate threat, and lack of foods. They offered the king of Gorontalo to build three fotresses on the top of Dembe Hill to protect the area. The Ilato King had two daughters name Ndoba and Tiliaya, and one son called Naha. However, after the construction of those fortresses, the Gorontalo princesses found out that Portuguese misused the kingdom’s kindness as device to drive away their pirates’ enemy. Then,the Gorontalo people turned back to dislodge Portugueseout of their kingdom. When Naha replaced his fathera and became the King of Gorontalo, there were a war from Hemuto, the leader of transmigrant in north region. In 1585, accidentally found Otanaha Fortress and used it as shelter of his wife, Ohihiya, and their two sons Paha (Pahu) and Limonu. During the war, Naha and Paha were killed by Hemuto. Then, Limonu made a revenge and killed Hemuto. The name of three fortresses used during the war was given based on Naha family. The first fort name, Otanaha, was from “Ota” means fort and “Naha” was the person who found the fort. The second fotress named Otahiya, from the word “Hiya”, acronym of Ohihiya (Naha’s wife). The third fort named Uwole which means Pahu’s (Naha’s son) fortress. O ya,,, jangan lupa follow saya di Google+ =>> plus.google.com/+RIMANLAMBASE untuk mendapatkan postingan terbaru lainnya!! !